Former Acting Chief Executive Officer (CEO) PIA Bernd Hildenbrand interview in December 12, 2017, edition of Aaj News programme Aaj Rana Mubashir Kay Saath. From the interview it becomes clear that PIA did not sell its Airbus A310-300 (AP-BEQ) parked at Leipzig Halle Airport, Germany, and that's why airport authorities are demanding aircraft parking charges from PIA and PIA has issued new tender notices for the sale of aircraft and its engines, APU etc. Mr. Hildenbrand says that Public Procurement Regulatory Authority (PPRA) rules were followed. Questions that need to be answered: Why this aircraft left Pakistan before completion of bidding process and how it was sent to Leipzig Halle Airport without bid price payment to the airline? Mr. Hildenbrand says the PIA aircraft at Leipzig Halle Airport was also used as part of press conference in which plan to operate PIA flights between Pakistan and New York via Leipzig Halle Airport was announced. Looks more like it was some sort of swap deal (apparently without proper procedures/rules or approval from relevant authorities in Pakistan) between PIA and Leipzig Halle Airport under which the A310 was handed over to airport authorities in exchange for operation of airline's flights between Pakistan and New York via this airport without some sort of fees/charges at least for some period of time. Details of agreement that approved usage of the aircraft in movie shooting in Malta also should be made public. Today, the Executive Board Meeting (EBM) of National Accountability Bureau (NAB) chaired by NAB Chairman Justice (retired) Javed Iqbal gave approval to begin inquiry into disposal/sale of PIA Airbus A310-300 (AP-BEQ) currently parked at Leipzig Halle Airport, Germany, that caused losses to the airline/national exchequer. NAB should also investigate the deal under which the aircraft was used for movie shooting in Malta before it went to Leipzig. Advertisement for the sale of PIA Airbus A310-300 (AP-BEQ) parked at Leipzig Halle Airport, Germany, given in December 8 edition of American newspaper(s), December 10 edition of Pakistani newspapers and December 12 edition of German newspaper(s). KARACHI: The mystery surrounding the sale of Pakistan International Airline’s (PIA) Airbus A-310 deepened, but action is yet to be taken against those responsible for the unscrupulous deal. The airplane, which flew from Karachi, arrived at Germany’s Leipzig airport via Malta and it was sold there. PIA served show-cause notices on former senior officers involved in the scam while the airline’s spokesperson said that the airplane was the property of the national carrier and it was sold after tender notices were issued in international and local dailies. The tenders are supposed to be opened on January 18 next year. A secret PIA inquiry report on the sale of A310 (AP-BEQ) was prepared and relegated to cold storage. The report was subsequently sent to PIA and aviation authorities on the directions of the chairman of PIA’s board but it is being kept secret. The inquiry report showed that three former officers of the airline were involved in the deal, including PIA’s acting CEO Hildenbrand, the Austrian technical advisor Helmut Bachhofner and the former director procurement. Two of the three officers were served show-cause notices but the third officer was not issued any notice. 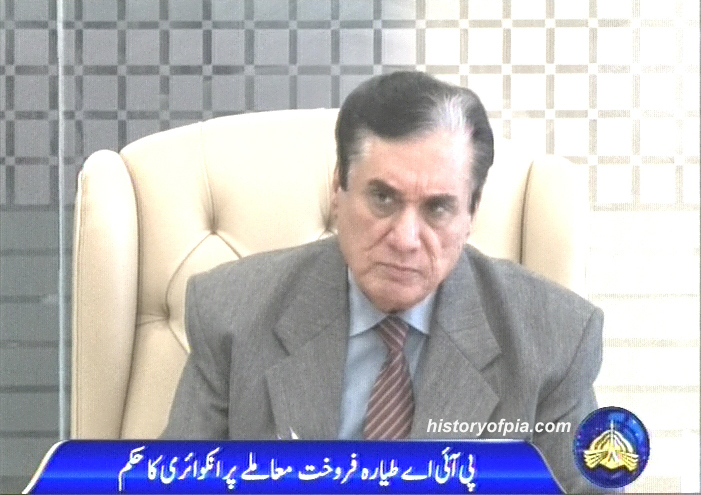 The inquiry was carried out by the airline’s internal auditor Javed Mansha and legal adviser Ahmed Rauf. A copy of the fact-finding report was obtained by the Express News. It stated that the jet was flown to Germany much before tender notices for the sale of the airbus were issued. The report stated that the aircraft was sold for 47,500 euros. The aircraft, although a PIA property, was sold without proper paperwork and without seeking the permission of authorities concerned. Show-cause notices were served on former German CEO Hildenbrand and technical advisor Helmut Bachhofner in this regard. Hildenbrand had gone back to Germany without responding to the show-cause notice while Helmut Bachhofner’s lawyers had submitted a reply after which he was fired by the airline. The procurement chief has not yet been issued any show-cause notice. A senate panel also took notice of the issue and questioned the authorities concerned but top officials of the airlines in Islamabad intervened, thwarting action against those responsible for the scam. It was discovered that PIA had temporarily hired technical adviser Helmut Bachhofner at $15,000 per month and tax on his salary was also paid by the airlines. Helmut Bachhofner worked in Pakistan without security clearance. After the sale of the aircraft he returned to Austria. Upon the insistence of Express Tribune, PIA spokesperson Mashhood Tajwar said that the inquiry report was submitted to authorities concerned. The aircraft, he said, was on a tarmac at Leipzig airport and fresh tender notices for the sale of the aircraft had been published by the airlines in the US, Pakistan and Germany on December 8, 10 and 12 respectively. He said that parties interested in buying the aircraft had been summoned by PIA on January 19 next year. The aircraft, he added, was PIA’s property, and its engines, spare parts, landing gears and avionics system would also be sold. Actually the A310 left Pakistan before bids opening day. Today, a Senate Committee was informed that NAB has begun investigation of PIA A310 sale to Germany and a number of airline's officials have been questioned. The A310 parked in Germany is still the property of PIA, said Aviation Secretary and Chairman PIA Irfan Elahi. Any idea what PIA owes in airport parking charges to the German airport. I have a feeling it must be equal to the value of the 25 year old aircraft. ISLAMABAD: The Senate subcommittee on Pakistan International Airlines (PIA), which is probing the circumstances under which Airbus A310 was sold to a German firm in violation of rules, was informed on Tuesday that the name of PIA’s former CEO, a German national, had been removed from the Exit Control List (ECL) on the specific order of then interior minister Chaudhry Nisar Ali Khan in response to a letter from the Foreign Office. The subcommittee headed by Farhatullah Babar of the Pakistan Peoples Party met in the office of the secretary of the Civil Aviation Division at the PIA complex in Islamabad. Nauman Wazir of the Pakistan Tehreek-i-Insaf and Tahir Hussain Mashhadi of the Muttahida Qaumi Movement are members of the subcommittee. The civil aviation secretary and officials of the PIA, ministries of interior and defence and Federal Investigation Agency (FIA) briefed the subcommittee about the sale of the aircraft last year. Four Airbus A310 planes were grounded in 2016 after completing flying hours in 27 years. One of them was used in a film shot in Malta before being sold to a museum in Germany. The meeting was also informed that under the directives of the Public Accounts Committee of the National Assembly, the case had since been referred to the National Accountability Bureau (NAB) for inquiry. The FIA has also taken notice of the matter and launched its own investigations. Civil Aviation Secretary retired Squadron Leader Ifran Elahi said that the sale of Airbus A310 had been stopped and that it was still the property of the government of Pakistan. He, however, said that negotiations for not charging the parking fee for the aircraft were still going on. The subcommittee members were surprised at the glaring flaws in the tendering process as neither the director procurement nor the PIA managing director had the authority to finalise the sale and move the aircraft outside the country. The meeting noted that when former PIA CEO Bernd Hildenbrand failed to return to Pakistan and after the expiry of one-month period, the interior ministry wrote to the Foreign Office to take up the matter with the German embassy in Islamabad on whose guarantee and commitment the permission had been granted. “We will demand of the Foreign Office to produce the written commitment/guarantee given by the German embassy and ask whether and when it took up the matter with the German embassy in Islamabad and what the response of the embassy was,” Mr Babar said. “We must not let the former CEO escape from answering some searching questions about the attempted sale of the aircraft,” he said. “If someone gave guarantee on his behalf, the guarantor must be held accountable and if there was no such guarantee then the officials responsible for allowing the ex-CEO to leave the country must be held accountable,” he added. The subcommittee was also informed that a fact-finding committee of the PIA found numerous inconsistencies in the sale of the aircraft to a museum in Leipzig, Germany. The subcommittee found former PIA MD Procurement Imran Akhtar responsible for the sale of A310, causing losses to the organisation. However, Imran Akhtar, who is the brother of former three-star general Rizwan Akhtar, defended his actions, stating that there were no mal-intensions behind the sale of Airbus to the German firm. The subcommittee observed that Imran Akhtar was not given a chance to be heard. Tahir Mashhadi objected to allowing a Jewish company to use the PIA aircraft to be filmed as a French airlines plane in what he called an anti-Palestine film, before the plane was flown to Germany. Secretary Aviation and Chairman PIA Ifran Elahi said that negotiations for not charging the parking fee for the aircraft are going on. * Former PIA CEO Bernd Hildenbrand was allowed to leave Pakistan by Prime Minister's Office. * Prime Minister Nawaz Sharif had advised that Bernd Hildenbrand be allowed to leave Pakistan and in this regard Prime Minister's Secretary met me, says former Interior Minister. * I had not suggested removal of the name of German national PIA CEO from Exit Control List (ECL), says former Interior Minister. * The German ambassador to Pakistan had assured that Bernd Hildenbrand will return in a month. * Wrong and baseless news reports are linking me on this issue. ISLAMABAD: Former interior minister Chaudhry Nisar Ali Khan spilled the beans on Wednesday, disclosing that the name of Pakistan International Airlines’ (PIA) former chief executive Bernd Hildenbrand had been struck off the Exit Control List (ECL) on the direct intervention from the Prime Minister Office. 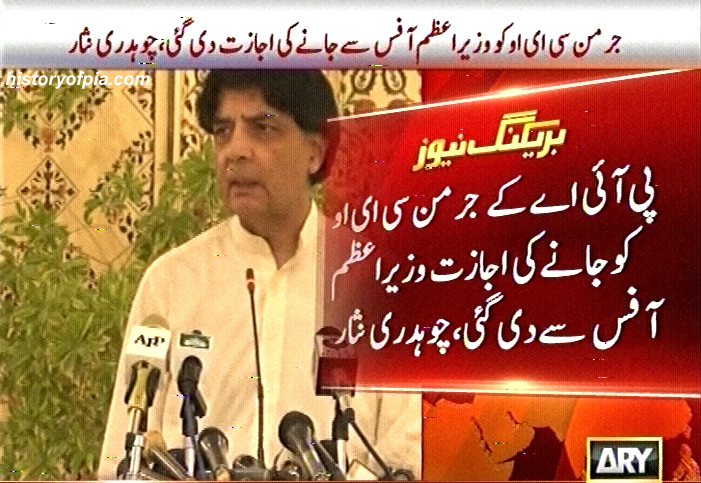 In a statement released by his spokesman, Chaudhry Nisar rejected the claim made by an interior ministry official that the ex-minister had removed the name of Mr Hildenbrand who is responsible for the unauthorised sale of a PIA plane to a museum in Germany. “To the contrary, the interior minister was not in favour of allowing PIA’s former CEO to leave the country without being held accountable for his alleged corruption. It was only on the intervention of the Prime Minister’s Office that permission was granted to Mr Hildenbrand,” the spokesman said. He explained that the German ambassador had contacted the Ministry of Foreign Affairs and given them an assurance that Mr Hildenbrand would return to the country after a month. “It was in the context of recommendations from the Foreign Office that the secretary to the prime minister personally met then interior minister Chaudhry Nisar and conveyed the directions of the prime minister to allow Mr Hildenbrand to proceed abroad for one month,” he said. The controversy over the missing PIA Airbus had been echoing in both houses of parliament, but nobody conceded that the plane had already been sold to a German museum. A senior PIA official said that the plane had been chartered by a British company for the purpose of a film which was to be shot in Malta following which the aircraft was taken to Germany. He added that the film company paid PIA over $200,000 as rent for the plane and the Airbus was flown directly to the Leipzig Halle Airport Museum in Germany. Both the plane and the former CEO are currently in Germany. Until recently, Mr Hildenbrand’s exit was a mystery, especially since the former CEO was facing corruption charges. A source privy to the development said that the German CEO had not only floated a tender to sell the aircraft but also hired a foreign consultant — who also held shares in the museum that was interested in purchasing the plane. He said Mr Hildenbrand had secretly negotiated the sale of the aircraft with the museum, without seeking permission from the PIA board. An internal PIA inquiry has found three of its top officials guilty of gross violations in the matter. In December last year, the PIA board of directors formed a two-member inquiry committee that found Mr Hildenbrand, director of procurement and logistics retired Air Commodore Imran Akhtar, who is brother of former three-star general Rizwan Akhtar, and technical consultant Helmut Bachhofner guilty of causing a financial loss of over Rs500 million to the national flag carrier. The committee’s report found that the entire sale process was based on mala fide intentions, as the original tendering process was tampered with to ensure that a single bidder was chosen. The 34-page report said that the price at which the perfectly functioning A310 had been sold was lower even than its scrap price. “A channel was designed by the persons responsible for the actions under inquiry to phase out A310 aircraft at present and other assets at a later stage. The entire team involved could not have achieved this objective without connivance of each other and planting of Mr Helmut [Bachhofner],” the report said. The consultant, the commission’s findings revealed, was a shareholder and partner in the only two companies that participated in the bidding. The committee also found it odd that although A-310 had been handed over to the German company, there was no payment made against it. Not a word from the current tender. The deadline ended on 15 January. Is the result already known. Looks like nobody wants to buy. A Senate special committee on Wednesday asked the Foreign Office (FO) to approach the German Embassy in Islamabad to extradite Pakistan International Airlines' (PIA) former CEO Bernd Hildenbrand for his alleged involvement in the unauthorised renting and subsequent sale of an Airbus-310 belonging to the national carrier last year. Hildenbrand and retired Air Commodore Imran Akhtar (brother of former director general of the Inter Services Intelligence (ISI), Rizwan Akhtar) are under investigation in Pakistan — the former for reportedly having flown the said Airbus to Germany and the latter for selling the same for the price of scrap in Germany. A German national, Hildenbrand had his name on the Exit Control List but was still allowed to leave the country for a month in June 2017 on the intercession of the German Embassy. Senate's Special Committee on PIA, acting upon the recommendations of a subcommittee, on Wednesday directed the FO to vigorously pursue the matter of bringing Hildenbrand back to Pakistan to face accountability. The committee also remarked that Akhtar's retirement from the Pakistan Air Force should be of no consequence in the investigation and that the matter against the co-accused should be pursued to logical conclusion. The National Accountability Bureau (NAB), which is already probing the matter on the directives of National Assembly's Public Accounts Committee, was urged to be diligent with its investigation and also asked to regularly inform the Senate Secretariat on the progress of the case. The report said the PIA management cannot be absolved in the scandal as it failed to report the matter in a timely manner and only came alive when the media and the parliament took notice. The missing Airbus scandal came to light last year and created such pressure that the incumbent air chief, Sohail Aman, had to issue a statement declaring that if Akhtar is indeed caught by NAB or the Federal Investigation Agency, the air force would not stand by their man (who was in service at the time). A few days later, ISI chief Lt Gen Rizwan Akhtar had resigned from service — a decision that raised a few eyebrows in Senate. ISLAMABAD: A parliamentary panel has recommended the government to pursue vigorously the sale of an airbus of the national flag carrier to a German firm at a very low price in violation of PPRA Rules in December 2016. The sub-committee of the Special Committee of the Senate on Performance of the PIA submitted its report to the main committee pertaining to probe into the circumstances under which the alleged sale of PIA airbus A-310 to a German firm took place in violation of PPRA Rules. The committee endorsed the report submitted to it by convener of the sub-committee Senator Farhatullah Babar in which it recommended the government to bring back the former CEO of PIA Bernd Hilldenbrand, a German national, who approved the controversial sale. In its recommendations, the committee stated that it is strange that, as claimed, the matter of the sale of aircraft was confined to only two officers namely the then CEO Hilldenbrand and ex-Director (Procurement and Logistics) Air Commodore, Imran Mukhtar Khan. It stated that the PIA management cannot escape a measure of responsibility, even though it took some positive actions after the matter became public. The committee noted that the actions taken such as terminating contract of the CEO and reverting the director (P&L) to his parent ministry seem too little too late, adding that the former was allowed to go abroad despite his name being on the ECL while the show cause notice issued to the latter was not pursued. It observed that the matter should have been reported to the FIA and the NAB soon after its seriousness had become obvious instead of waiting for media/parliamentary attention and the Public Accounts Committee (PAC) of the National Assembly directing that the matter be referred to the NAB. “As the matter has since been referred to the NAB, there is a need to diligently pursue inquiry/investigations and keep the Senate Secretariat regularly informed about the progress made,” it stated in the recommendations. It recommended that two firm and clearly defined steps need to be taken: firstly, the then CEO Bernd Hildenbrand who was allowed to leave the country for a month despite his name being on the ECL should be brought back. The Foreign Office should be asked to vigorously pursue the matter with the German embassy on whose intercession the limited one-time waiver from the ECL was reportedly granted. Secondly, the show cause notice issued to the then director (P&L) be pursued to logical conclusion and the Senate Secretariat be regularly kept informed of the progress in both. The PIA in its initial report to the committee stated that in October 2016, its acting CEO Bernd met with Leipzig Airport authorities to discuss launching of New York flights via Leipzig. Concurrently a Leipzig Museum Authority expressed interest in buying AP-BEQ to place it as the Leipzig Museum in PIA livery at a price of Euros 47,500 for the structure. However, no commitment has been given to the Leipzig Airport authorities till date as the case was moved to obtain approval of Board of Directors (BOD). They were, however, instructed to send their offer against the open tender which would be published. Hence another tender was floated for sale of 04 aircraft including AP-BEQ on 9-11-2016 for bid opening on 12-12-16, which was later opened in the presence of media on 13-12-16 due to Eid Milad-un-Nabi holiday. In the meantime a London based company, M/s Aviaction Ltd approached to lease one A-310 aircraft for a movie to be shot at Malta. The contents of the movie were not conveyed to the PIA. AP-BEQ was due for a c-check on 25-10-16 and could not fly without a waiver after 27-11-16 due to structure reaching its life. Therefore, a waiver was obtained from the CAA to fly without passenger’s load, to Malta where it participated in the film shooting in Air France Livery. After shooting the aircraft was painted back to PTA livery and aircraft was flown to Leipzig. The PIA received euros 210,000 for this charter. The aircraft was flown to Leipzig from Malta as the flying time is only one hour and 35 minutes and it would save the cost of fuel and over flying charges as compared to flying back to Karachi. The PIA in its report further stated that on 13-12-16, tenders were opened in the presence of media and only bid received was from Leipzig authorities with another company M/s Firefly which submitted the bid for the purchase of engines and APUs. The evaluation process is underway to ascertain the admissibility of the only received bid. The PIA has also mentioned that internal approval of the sale of AP-BEQ was obtained from acting CEO before the actual publishing the tender to facilitate processing the case for approval of BOD, which was duly processed on 24-11-16. The total amount earned by this aircraft is euros 257,000 which includes the charter service payment of euros 210,000. No bid was received for the rest of three A-310 aircraft which will be tendered again. The committee, in its findings, pointed out that neither the director (P&L) nor the acting CEO had the authority to negotiate, finalize and move the aircraft for sale at Leipzig. It was found to be a violation of deregistration, retirement rules and regulations to be followed before selling the aircraft, it added. It always means that Airbus is still owned by PIA. Therefore, PIA should also pay parking fees to the airport in Germany and the sale of the aircraft was only tendered in December 2017 by PIA. Since the Airbus can not have been sold at the scrap price ?? ?